Speaking of annoying, the other day when I was on my way to Performance Bicycles… The story could end here. But it doesn’t: when I was on my way to Performance I had a not-very close call with a careless SUV driver. She started pulling out in front of me (in a parking lot intersection) looking the other direction. When she finally looked to her left, half way into the parking lot intersection by now, she stopped suddenly and I passed in front of her mouthing the words, “pay attention” and shaking my head. I forgot all about it one minute later as I entered Performance’s grand 50% off sale that they have every other day. My friend Will was working there that day, so I began talking to him about his new Euro Van that he’s currently retrofitting to live out of and travel with for climbing trips. Suddenly the woman who’d nearly, but not really, come close to hitting me in the parking lot came up from behind and furiously asked what I’d said to her in the parking lot. The next five minutes escalated into a one-sided yelling match (her) as I tried to rationally explain to her why she was A) wrong, B) irrational, C) asking for a knuckle sandwich, and, D) a raging lunatic. She kept stepping closer and closer to me as the rest of the store retreated in awe and stifled laughter. This lady was pure nuts. Her eyes were blood shot and yellow and she smelled of a not unpleasant dish of cooked vegetables. She ended every sentence with, “young man!” As in, “I’ve been riding a bicycle a lot longer than you have and I’ve never been that close to a car before or ridden that fast in a parking lot, young man!” She said I was going way too fast for her to even see me. In my defense I had been driving my hunk of junk mountain bike at about 15 miles an hour or less, which was still “way too fast” for a motorist to see. Yes this makes sense, because cars always drive 14 mph or less and when they do go over 15, they become invisible, just like bikes. Anyways, after the argument had finished, with me staying super calm since I could see there would be no reasoning with her (with my calmness angering her even more) she got in line to see the mechanic. Low and behold, she’d been on her way to Performance to pick up her bike. I bought a tire and all the employees came over to laugh in amazement and apologize about her. “Yeah, she’s crazy. She works for the government, so what do you expect?” said one of the Performance guys. I imagine her as some civil bureaucrat, working hard to make sure things never work properly. The fact that she was a cyclist herself shows the true hopelessness of the corrupt human mind. You can’t argue with or reason with an irrational, angry, frightened, stupid, or naïve person, so the best thing you can hope for is that you have something in common with them for which to sew the bleeding wound shut and come to terms over a shared passion. If you can’t find one, then you might as well be yelling at a brick wall. In some cases, even if you do have something in common you still might as well be yelling at a brick wall. I’ve barely touched the bike since Sunday. I did a few easy recovery spins on Monday and Tuesday, and ever since then all I’ve done is some light commuting each day. I trained so hard last week that by Monday I was right on the cusp of getting sick. It took me about three days to get over feeling heavily fatigued, achy, nauseous yet extremely hungry, hot, then cold, yes then no, I was in then I was out, I was up then I was down, wrong when it was right, black and then white. Katy Perry style obviously. But my immune system prevailed with some COPIOUS, let me spell that one out for you: CO-PEE-US amounts of baked garlic, salmon, and asparagus. With these three miracle foods you can pretty much kiss any illness or injury goodbye. Your kiss may reek like an overused outhouse, but I digrest…garlic very poorly. (That word was spelled wrong on purpose, Grandma. It’s a combo of digest and digress). I’ve taken to baking most of my food now. Just this past week I’ve discovered the simple ease of baking rather than stir-frying. Are you tired of constantly having to stir things while you fry them? 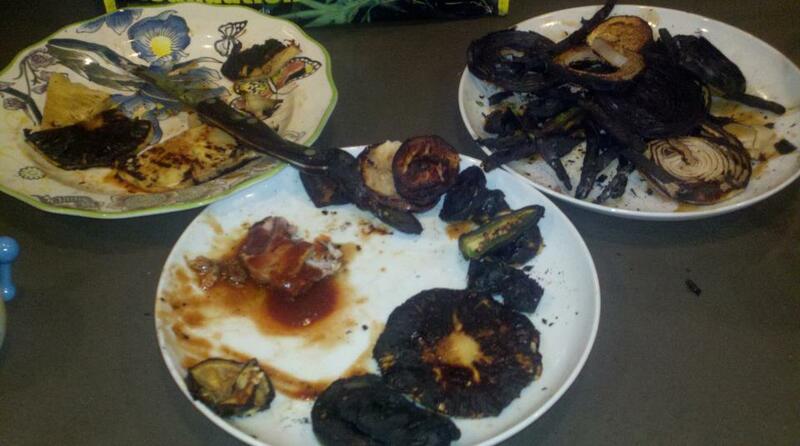 Do you sometimes forget to check on your food every couple minutes, resulting in charcoal? 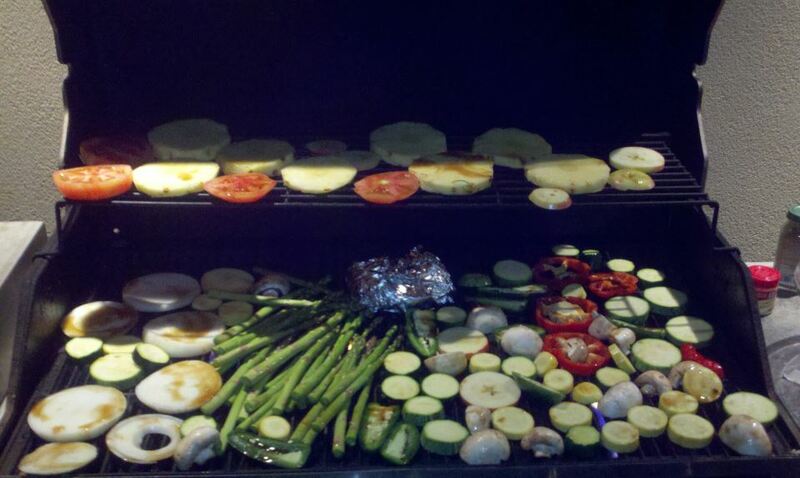 Pineapple, regular apple, tomato, ahi tuna, asparagus, sweet onion, mushrooms, zucchini, yellow squash, brown Mexican squash, jalapenos, and red bell pepper. After stopping by my favorite grocery store of all time, Sunflower Farmer’s Market, and buying $700 worth of good vegetables for grilling, Kim COMPLETELY burned everything within 15 minutes. I told her to not use the maximum heat setting, but she was too impatient. I told her that we should check the food in five or ten minutes to see how it was doing instead of pounding cereal inside like there was no tomorrow, and that if she didn’t know how long pineapple or tuna needed to be on the grill, she should look it up, not just guess. 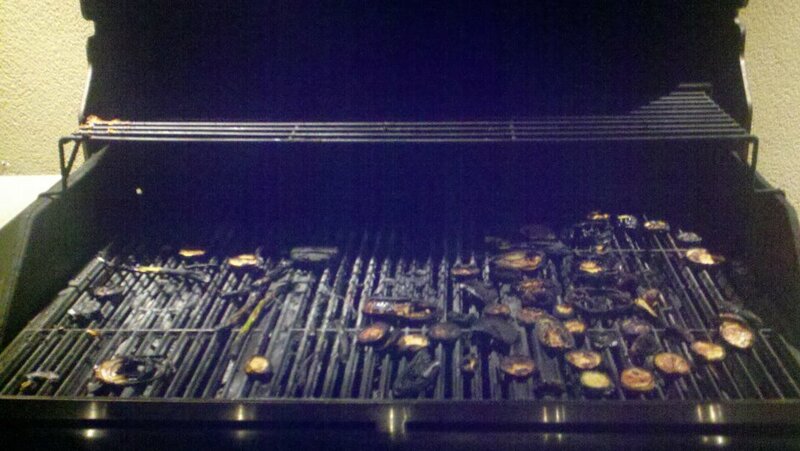 But not everyone is as patient or grilling-astute as me, for this would never have happened had I been in charge. Kim didn’t listen to me at all and burned all the food to an inedible crisp. Even the raccoons will get cancer if they consume even the slightest bit of the carcinogen-laden burnt bits of “food” we scraped off the grill into the lawn. (Of note: famous pro triathlete Matt Reed eats the same cereal I do: Panda Puffs!) Kim and I had the failed BBQ at his place since Kim is house sitting for him. And because he’s away for the month and I knew he wouldn’t want a single Puff of peanut buttery Panda to go to waste, I helped lighten the load on his pantry by finishing a box or two). But back to baking: are you a lazy slob who just wants to watch youtube clips of Paris Nice and forget about stirring things for hours on end and would prefer for your food to do its own damn cooking? Well I’ve got the solution for you! Baking! It’s so simple. I’m sure you’ve never heard of it before, so let me explain. All you do is chop up everything and put it in a baking dish, cover with tin foil, and put it in the oven for 20-50 minutes. Why, right now I’ve got a luke-warm tub of baked veggies and canned salmon sitting in my knapsack just waiting to be opened on the airplane for everyone to vicariously enjoy. In it: 1 massive bunch of asparagus (87 cents/pound at my favorite grocery store of all time: Sunflower Farmer’s Market), mushrooms, tomatoes, eight cloves of hard neck garlic, one can of canned salmon, spices, salsa, and some chopped up ham I found in the back of the fridge. (Warning: extended periods of time spent consuming more than two cloves of hard neck garlic per day will result in garlic intolerance syndrome, a condition that results in terrible digestive issues occurring every time you consume more hard neck garlic). hahaha LIES! Very nice try there, Betty Crocker…but as you’ve openly confessed to the crime of Peanut Buttery Panda Puff larceny, any rational mind would know better than buy into your attempt at blaming the poor, innocent, hungry manual laborer who spent hours washing and chopping each wasted vegetable individually before they were disintegrated into toxic waste. I believe you left your grillmaster man card back here in Colorado – in the grass with the carcinogenic ashes that have surely caused the squirrel genocide currently happening in NoBo. BAM. BOOM. and whatever else.